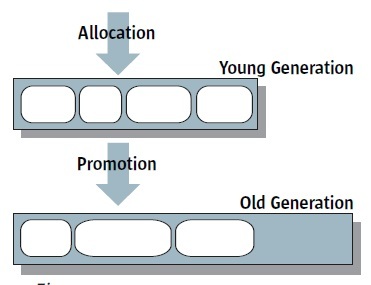 Young (New) Generation - Stores objects that have shorter lives with less memory space. Garbage collections occur more frequently in Young Generation. The operation of garbage collection in the Young Generation is referred as Minor GC. Faster and less space efficient garbage collection algorithms can be chosen for Minor GC. Tenured (Old) Generation - Stores objects that have longer lives with more memory space. Garbage collections occur less frequently in Tenured Generation. The operation of garbage collection in the Tenured Generation is referred as Major GC. More space efficient and slower garbage collection algorithms can be chosen for Major GC. A new objects is normally allocated in the Young Generation first. If it survives some number of Minor GC, it will be then promoted to the Tenured Generation.